Just in time for NESEA Building Energy ’13 Exhibition! 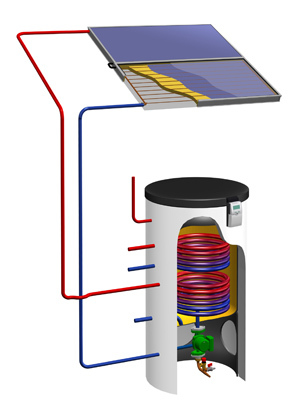 Wagner Solar Inc.; the US subsidiary of Wagner & Co, a pioneer in solar thermal technology for over 34 years, is introducing a new line of high performing solar domestic hot water appliances to tackle the nine million unit hot water heater market. Backed by an electrical heating element (4.5 kWel), the SECUSOL thermal appliances can be used to immediately retrofit existing DHW heaters. Installation time for a typical SECUSOL including collector mounting is cut to 4-6 hours. Within 2 years, SECUSOL has captured a market share in Massachusetts of 37% and is the lowest end-user priced solar thermal system in the Commonwealth. Installer training is required under the Wagner Academy or Wagner Academy Online to become a SECUSOL installer. This message contains information which is intended for the individual(s) named. Please notify the sender or webmaster@wagner-solar.com.au immediately by e-mail if you have received this e-mail by mistake and delete this e-mail from your system. E-mail transmission cannot be guaranteed to be secure or error-free as information could be intercepted, corrupted, lost, destroyed, arrive late or incomplete, or contain viruses. The sender therefore does not accept liability for any errors or omissions in the contents of this message, which arise as a result of e-mail transmission. If verification is required please request a hard-copy version. For further information, please email info_us@wagner-solar.com. The electronic newsletters which are distributed are provided for informational purposes only, we accept no liability for any interpretation or misuse of the information provided. The information is provided „as is“ and we cannot make any guarantees to the accuracy of the information which is available after the date of publication or original transmission. We do not provide any kind of warranty with this information. We take your privacy seriously and do not distribute or forward your contact details which have been provided by you to any third parties or parties outside of Wagner Solar Inc.
– All text must be copied or forwarded without modification and all pages or documents as per original must be included. – Any copyright information or trademarks must be included. – No part of the document is to be reused for purposes of profit. If you have any further questions or comments regarding the use or transmission of these services, please feel free to contact us at anytime.